Thanks to Alain Pierrot who sends me links to the very best examples of book related art and stuff. Actually I saw these rivetingly readable sheets at the Royal College of Art end of year show last year, but didn't have a camera on me at the time - it's good to see them again. "This Weird blanket is from a SLEEPLESS project collaberated between The Great Eastern Hotel and fourteen students from the Royal College of Art’s acclaimed Design Products department led by Professor Ron Arad. 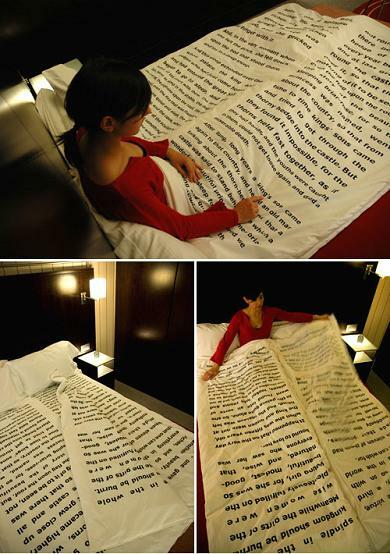 This blanket has some traditional bedtime story on it.Plus, it has several sheet just like a real book."